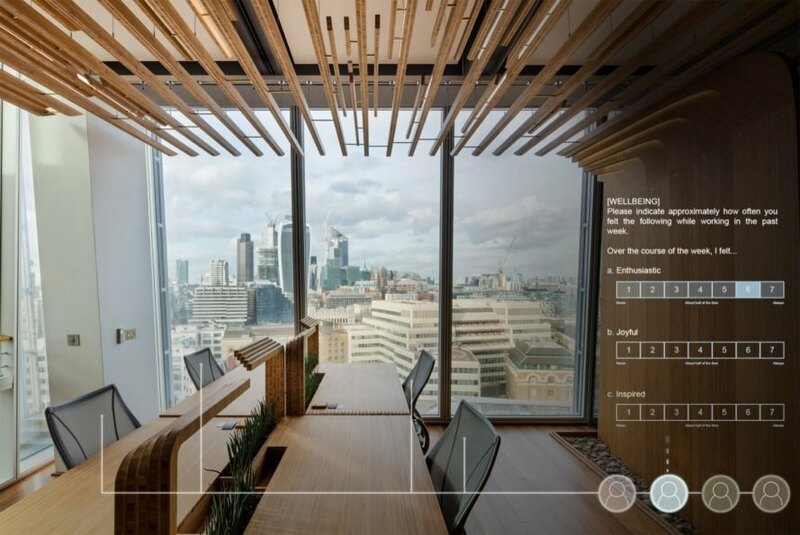 As its name suggests, the Living Lab at The Shard will be used as a pilot study to measure the impact of biophilic design on worker wellness and productivity. In addition to the client, the project was created in collaboration with Dr. Marcella Ucci (head of the MSc in Health, Wellbeing and Sustainable Buildings at the University College of London). 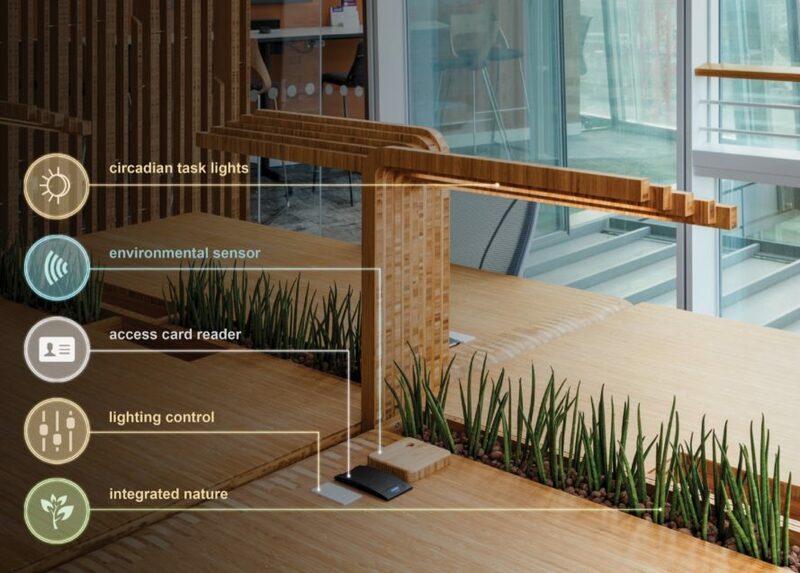 A post-occupancy study will compare daily surveys of Mitie employees who will work at the Living Lab desks for four weeks at a time followed by a four-week work period in a “control area” on the same floor with similar environmental conditions but without biophilic design. The project comprises two main spaces: the “Living Lab” immersive work environment and two “Regeneration Pods” for short-term rest and meditation. 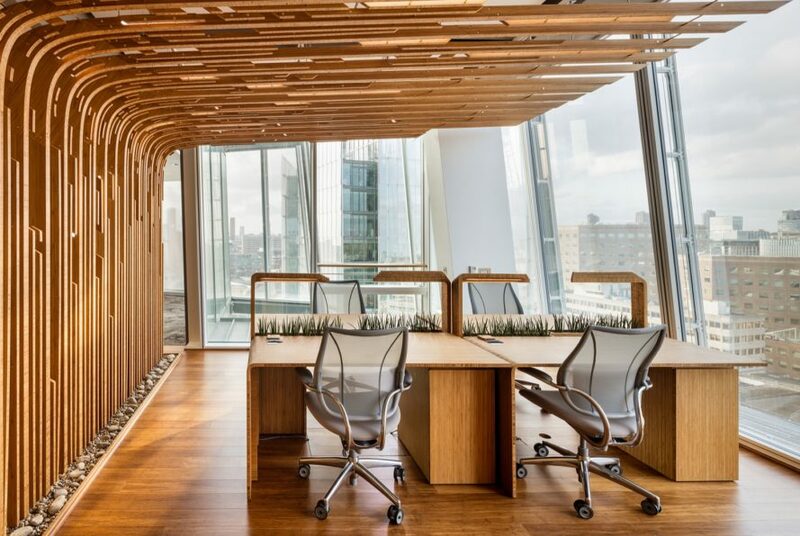 Bamboo was used for the sculptural privacy screens that curve up at the ceiling; different textures and shades of bamboo were also used for the floor, desks and task lights providing a warm contrast to The Shard’s cool glass-and-metal palette. 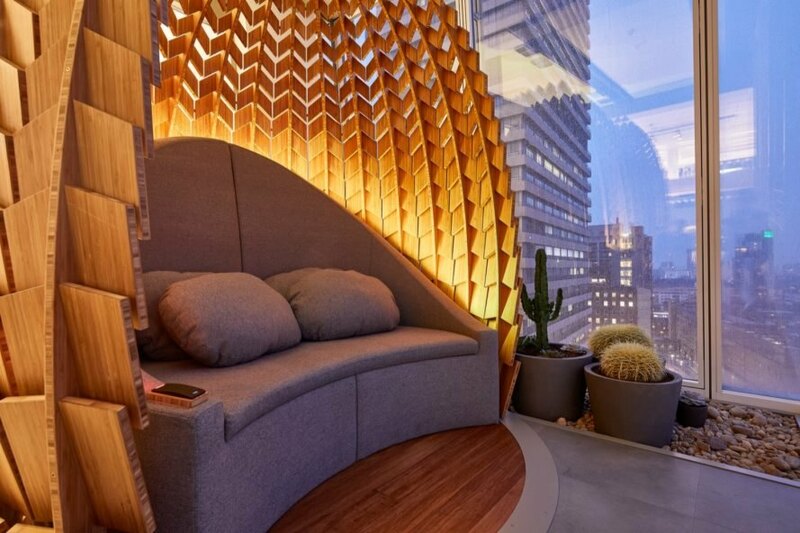 The Regeneration Pods, also built of bamboo, were created by combining digital fabrication with hand-finishing techniques and feature plush built-in seating that faces walls of glass for city views. A subtle circadian lighting system uses color-changing lights to mimic the sun — a cool blue is cast in the morning that changes to bright white in the afternoon and finally reaches a fiery orange near sunset. This experimental office by DaeWha Kang Design is meant to explore how biophilic design impacts employees. The office, called Living Lab, is located on the 12th floor of The Shard in London. Bamboo is found throughout the office. Many desks face glass walls that reveal stunning city views. Live plants are meant to boost employee wellness. The design emphasizes the use of natural materials. Employees will have unmatched vistas of London. An innovative circadian lighting system will mimic the sun with blue, white and orange lights depending on the time of day.